I don’t know why I haven’t already written about this painting. To me it was my ‘piece de resistance’, twenty one years of painting on silk culminated in what turned out to be almost my ‘swan song’. I had been growing Cannas for a very many years, both at the Possi Gallery and in our current garden. I can’t even remember when or where my love of cannas began. Quite out of character for me with their bright orange blooms. It may have even been at Taunton Flower show, or even a Somerset roundabout! I had also painted them many times, mainly with the leaves, as tall majestic plants exploding with colour as they reach for the sun. Throughout all the years of painting and growing them, there was an elusive painting brewing deep inside. I wanted to capture their essence, the vibrancy of their orange. I wanted to paint them so that the viewer was immersed in their beauty. I grew them outside of my studio and so with careful planning I was able to adjust my frame and paint them without having to pick them. Usually with one flowering head coming into bloom in late August or September, this wasn’t a plant to pick to paint. Usually I would hold a flower in my left hand whilst I painted it with my right. Maybe that was a way of ‘transferring’ the energy of the flower I was painting. I had had many comments about the vibrancy of my flower paintings and I had begun to think about what made a painting on silk so different from an oil or watercolour. I was coming to the conclusion that it had something to do with me holding the flower, but also the speed with which I had to paint it. I observed that when painting flowers in oils, the process took me so long that the finishing touches were done using photographs of the flower, long after the original subject had withered and died. With silk painting, speed was the essence. By not using Gutta and painting freehand, the likeness was built up using hundreds and hundreds of tiny brush strokes. As each one dried, another would be placed on top to intensify the colour. When enough layers of paint were on the silk, it would ‘clog’ up the fibres enough that it would act as a barrier. This enabled me to then do washes of colour over the painting to bring it all ‘to life’. I also worked quite large, often making the flower several times bigger than it’s actual size. 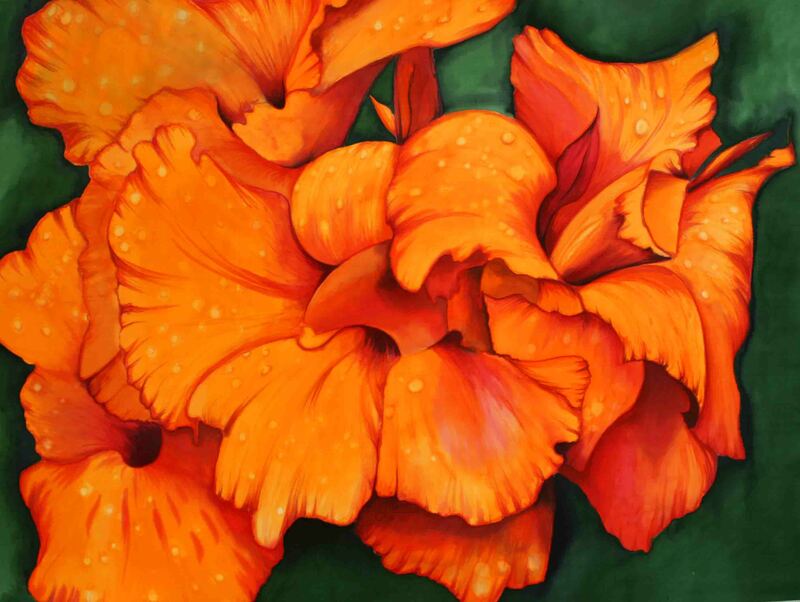 One morning in the Autumn of 2007 I awoke just knowing exactly how to paint my dream canna painting. My cannas were blooming, and luckily I had enough that I felt confident I could pick a stem to hold and paint from. It was a good year for them, and I had a specimen that was covered in blooms. I stretched out a two meter by 90 cm piece of habutai silk and set to work. As I was in the middle of working towards my Cork St exhibition, i was already well into the flow of painting. My studio had several frames with paintings on the go, my paints ad brushes were all ready set out, the kids and husband were also getting used to me being busy in my studio, not to be disturbed! To get started in painting I would play music, quite loud, on my Bose from my ipod. Nena Cherry and Prince would get me into the mood. Kate Bush and Kirsty MacColl would keep the flow going. When really into painting, a random ‘shuffle’ would play anything from Abba via Israel Kamakawiwo’ole to Yusef Islam. I would be singing and even dancing along whilst my brush did the work. This painting was special from the word go. Every brush stroke seemed channelled from a higher force. The painting literally poured straight through me, the essence of the Canna in my left hand travelling up my arm, then down my right arm straight onto the silk. Some paintings are hard work, paint not spreading as you’d hope, ‘accidents’ where the paint travels too fast, or slow, colours not mixing right, but not this one. With each brush stroke and application of colour my excitement rose. I was grinning from ear to ear as the painting seemed to dance straight onto my silk. Some of the paintings I had worked on had taken months, a few days to ‘capture’ the flower, but then weeks and weeks filling in the detail of the vase or background. This painting was done in a matter of days, start to finish. I couldn’t bear to leave it to eat or drink. I knew that this was ‘it’, dare I say it, my ‘Best’ painting. Although I had always painted figuratively, I was beginning to understand what abstract art was all about. I was sharing the exhibition with the very talented artist ‘Terri Hogan‘ who is a master at ‘capturing the essence’ of Cornwall. Her sea and landscapes would have just enough for my brain to understand, but she was ‘cutting out the crap’ that gets in the way. Pure whites, turquoises and blues filled her canvases transporting the viewer to a magical memory of a perfect day in Cornwall. ‘Perfect’ included the storms as well as the sunshine. As soon as I felt I had finished the painting, ( which again was easier than normal, I just ‘knew’ when to stop) I took it over to my framers in Bruton and let them frame it ready for exhibiting. Just before the exhibition in london, I held a small private viewing of my collection of paintings in our house and the studio. It was for friends, neighbours and customers of my work, especially for those unable to see the one week show when it was set up in London’s Cork Street. I had labelled all of the work ready for the show, including the ‘London’ prices. They of course caused some comment, but I was confident and so very proud of my huge Canna painting hung above our fire place. When in London, the Canna’s was hung on the back wall of the gallery. It could be seen from the street through the large windows and was spotted by an art collector as he was driven along Cork Street on the Monday morning. After a second visit and many discussions the collector bought it, along with two other of my paintings and the discussions were long about how I had priced my Canna’s higher than other paintings of a similar size. He was trained as an economist and now owned a pharmaceutical company so he took some convincing! How do you put a price on your favourite painting. The one that you not only want to keep for ever, but you also want to share with the world, ‘Look what I did!’ Yet it never felt like something ‘I’ did, I was more the delivery agent, this to me was a divine painting that I was lucky enough to deliver. It was this feeling that I had about paintings not really being by me that gave me such confidence when exhibiting and selling, I was amazed and intrigued by them as much as anyone looking at them for the first time. So my painting was sold, with two companions, and eventually shipped out to Beirut where I believe they still hang. When I deliver the paintings to the customer in London I was truly humbled seeing his collection of Pre Raphaelite oils and Victorian watercolours. It was such an honour that an art collector with so many paintings that I’d seen in books had fallen in love with mine. He also enjoyed giving me a tour of his house telling me the stories of his collection. Despite his jaw dropping collection he rarely had visitors who fully appreciated the work. I was sad to have only had my canna painting in my possession for such a short time, but like a child, I knew it had to leave home. I was compensated financially though and the profit made was used to treat my husband and I to a much needed stay at Burgh Island in Devon… but that’s another story. Previous Was it ‘Wirth’ it?